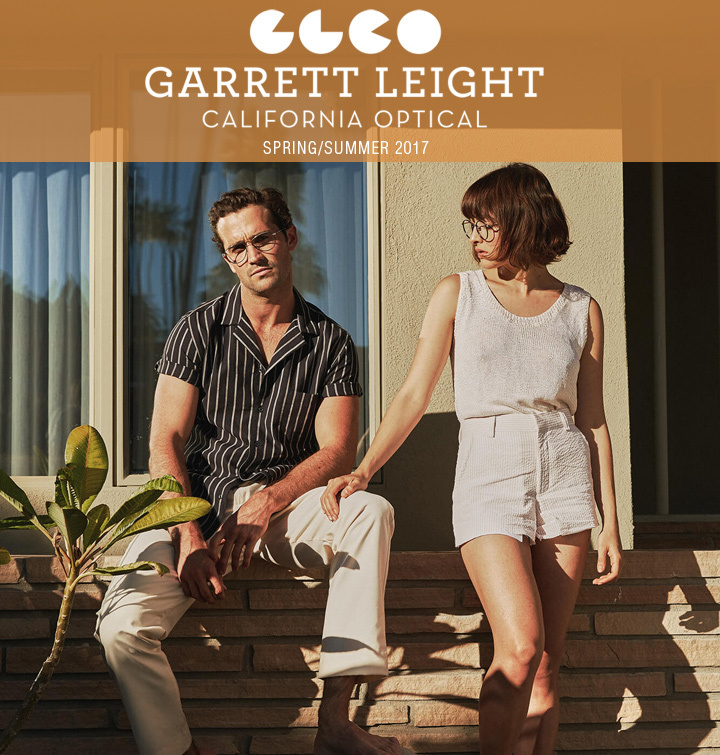 Garrett Leight California Optical, as the name suggests, is designed in California, with the signature laid back spirit we have come to love. However, its not just for locals. Highlighted in the Holiday 2017/18 collection, is that it’s designed for everyone, all face shapes and sizes, skin tones, and genders. Simply put, the frames work on just about everyone who puts them on. 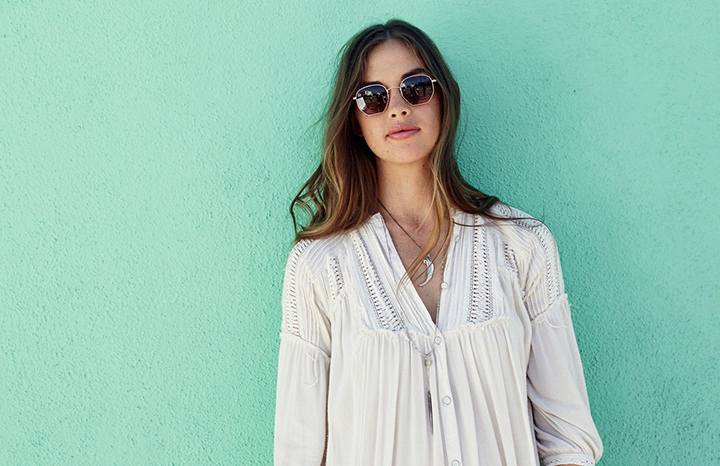 There is a wide assortment of new sun, optical, and clip-on styles added to the lineup. Each design showcases their own fresh eclectic details, unique finishes, and colorways that help define the season. Some of our favorites include the timeless Penmar and Garfield. A rounded and squared design that mixes acetate and metal in new ways, and come complete with Garrett Leight’s signature clip in complimentary tones. Everything about these just feels substantial and rich. Then there’s the Vista sunglass (above), a new sleek winged cat-eye design, done-up in a tone-on-tone rose gold. The Garrett Leight Spring Summer 2017 collection is one of the most expansive and technical to date. The range explores new shapes, finishes, and textures influenced by the American Southwest – all while maintaining that signature classic, clean, California-cool aesthetic we can’t get enough of. 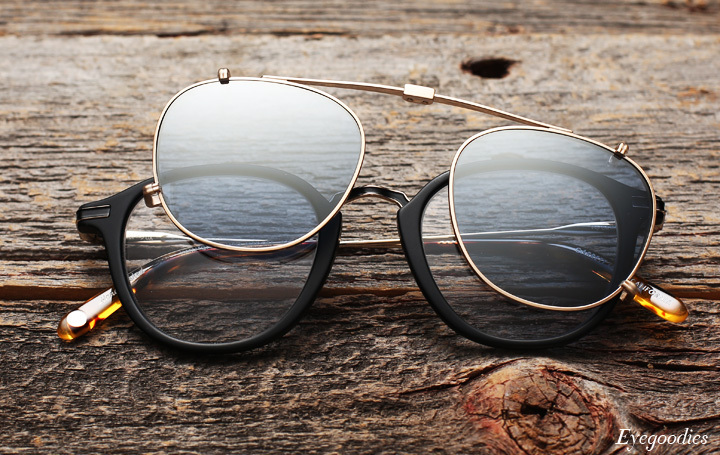 Encompassing both sun and optical frames, the collection features completely new shapes such as: the Canal, a squared off aviator with inverse windsor rims and color filled inlays. The Seville, a rounded sunglass with Sapphire gradient semi-flat lenses. As well as the Linnie optical with its coin edge filigree. However the highlights for us are the refreshed classics. The Van Buren and Kinney reimagined with metal and acetate combinations, adding a new level of depth and richness to the designs. Semi-flat lenses, lenses in earth tones,deep gradients, and metallic layered mirror finishes brings an assortment of new color and reflection. 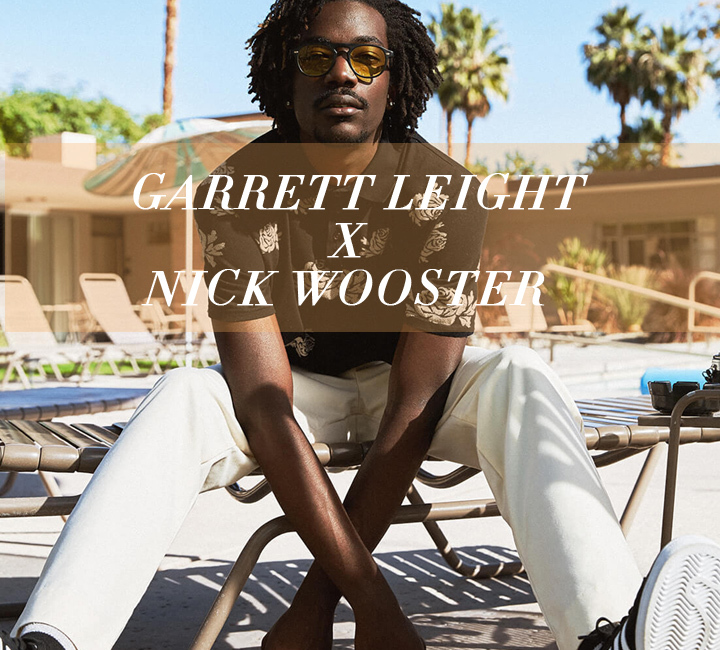 Garrett Leight California Optical and fashion icon Nick Wooster kick off spring/summer with a new limited edition collaborative sunglass. For the special project, one of Wooster’s all time favorite Garrett Leight designs, the classic Harding style has been updated with bold custom acetates and semi-flat lenses featuring a distinctive breath logo. 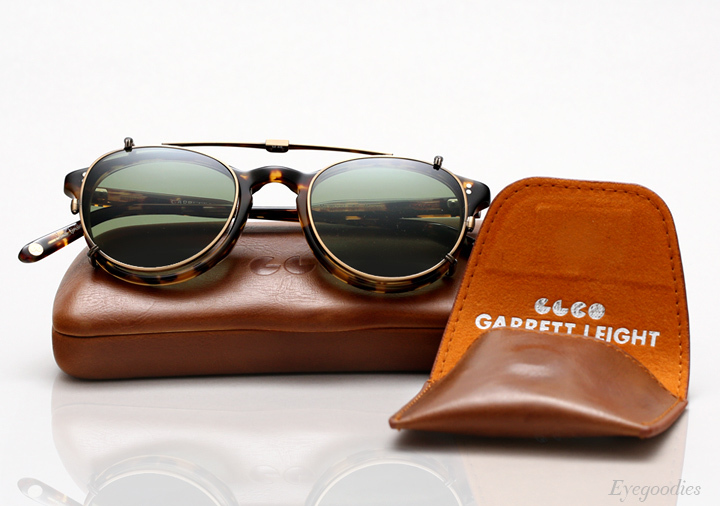 Additionally to mark the occasion, the inner temple of each frame bares “N.W X Garrett Leight”, and each frame comes packaged with a special edition grey leather Garrett Leight case, and uniquely designed cleaning cloth. It is available in three one of a kind colorways: “Sunshine”(black with semi flat sunshine tinted lenses), “Horn” (java drift with semi-flat pure cobalt lenses), and “Military”(green tortoise with semi flat pure green lenses). Following up on their Pre-Fall release, Garrett Leight is back with some California cool new additions for his Holiday 2016 lineup. This years Garrett Leight Holiday 2016 collection is inspired by the light, looks, and lifestyles of the American Southwest. The soft tones and surreal landscapes, the washed out and vivid contrasts, the interplay of earth and sky all made their way into this collection’s colors, finishes and mix of materials. Standouts for us include the completely new Mckinley design. An ultra-clean and classic frame, that fits just about anyone that puts it on, man or woman. It features subdued frame colors, juxtaposed with eye-catching semi-flat glass lenses, including some beautifully light colored lenses. 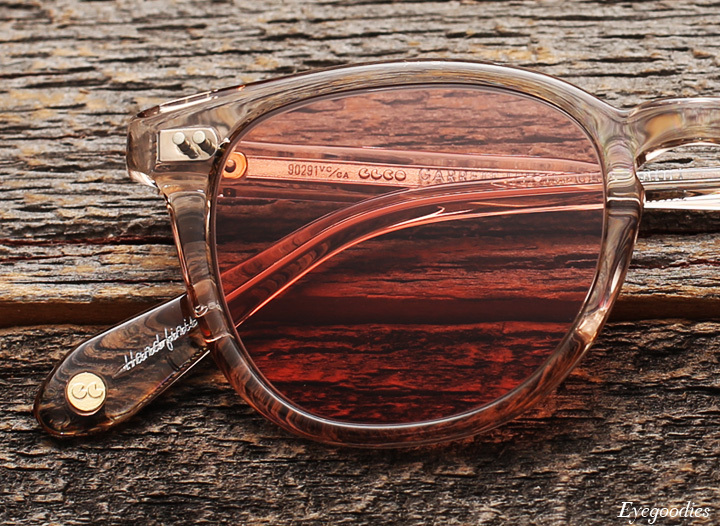 Other highlights include the reinvention of some our of all-time favorite GLCO styles. Such as Ultra thin Kinney Metal. 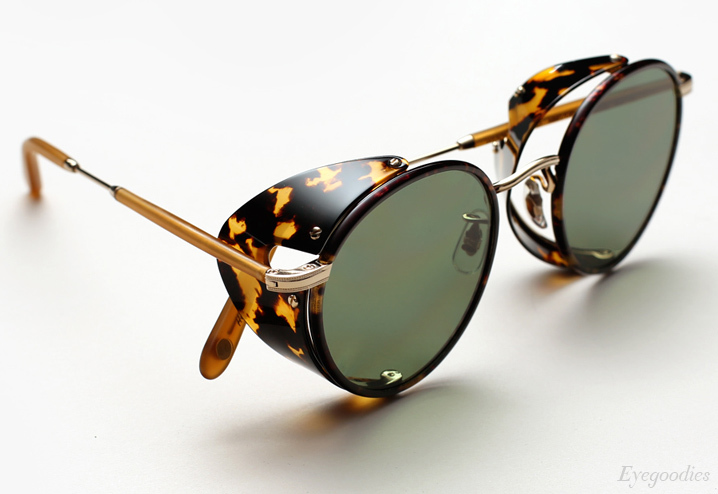 Or the “Hampton Combo”, an adaptation of the classic Hampton style, made using a combination of metal and acetate. 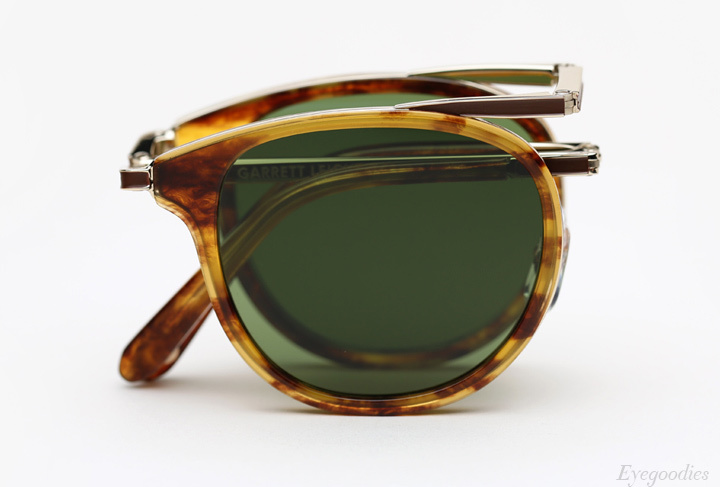 Taking it a step further the Hampton Combo, is also available with Garrett Leight signature metal folding clip. Garrett Leight California Optical introduces a new limited edition sunglass in concert with esteemed American designer Mark McNairy, we present the “Liberty”. Structural, yet airy, light, and soft, the Liberty balances several elements with ease, resulting in a frame like no other. It features a semi-hexagonal front and temples made entirely of stainless steel, paired with titanium nose-pads, and finished with beautiful gradient colored lenses. 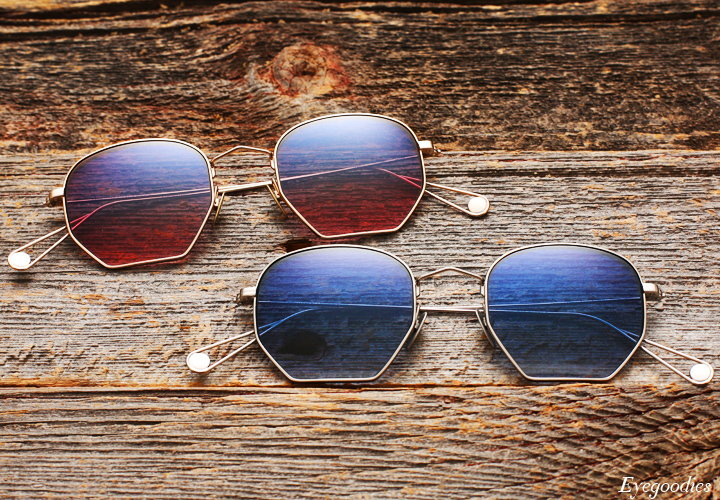 Your choice of silver metal with cool blue gradient lenses, or gold with soft pink gradient. The frame comes complete with a special edition case and packaging to commemorate the collaboration. 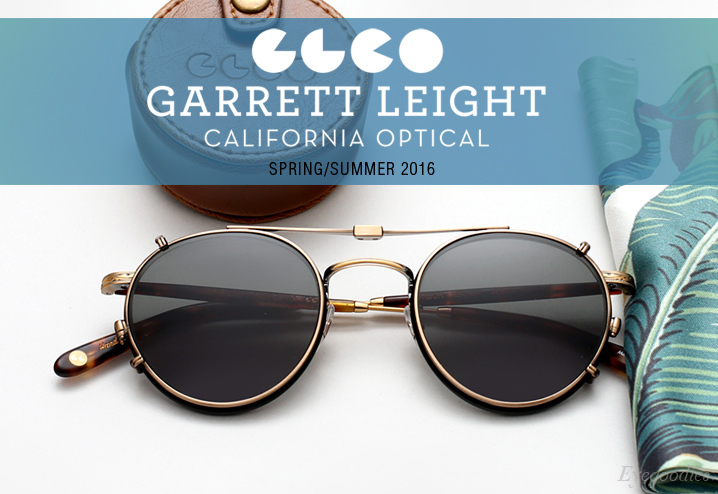 Celebrating five years of laid back California cool designs, Garrett Leight releases his Spring Summer 2016 collection. This special anniversary season pushes the boundaries in both innovation and design, a culmination of not only everything that came before, but also looks beyond. Fans of the brand will notice new takes on familiar designs. Such as the Wilson and the Brooks eyeglasses which now sport foldable metal clip-on lenses, rightfully joining Hampton, Kinney, and Milwood. There is also a host of completely new sunglasses and optical frames introduced into the line-up. Some of our favorites include, the Cordova with leather wrapped rims, and the Paloma which features inverse Windsor rims. As well as the Warren, clean, well-proportioned, and universally flattering. The lens highlight has to be the matte mirrors on the new Grayson. This is definitely the most technical collection to date: leather wrapped metal, detailed metal filigree, multi-tone acetates, inverted Windsor rims, layered and matte mirror lenses, to name a few of the highlights. Of course all this while maintaining the signature classic aesthetic we loved 5 years ago, and we have only grown more fond of today. Check out all the latest additions below. 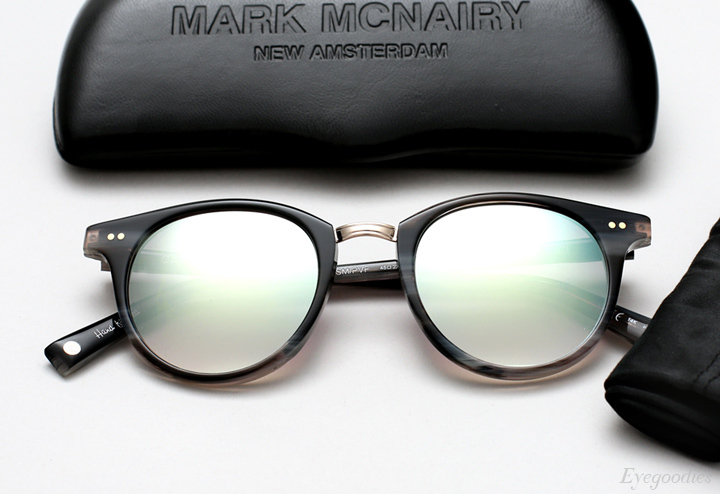 Coming off the success of their previous pairing, Garrett Leight California Optical and esteemed American designer Mark Mcnairy are back with a new limited edition collaborative frame for Spring/Summer 2015. Available as both a sunglass and eyeglass, the “Pinehurst” is a classic unisex round shape. Distinctive features include inlaid metal surrounding each lens, as well as a metal bridge with filigree detailing to lend a vintage touch. Additionally it features 5-barrell hinges for strength and durability. “Reminiscent of 1980’s England, but meshed with a modern New York sensibility”. Some cool subtle touches include: “Veni Vidi Vici” (Latin for: I came,I saw, I conquered”) on the inner left temple. As well as McNairy’s signature “TCMB”(Taking Care of Mother #&@%-ing Business) on the inner temple tip and behind the bridge. It is available in three unique colorways: Storm, Demi Tortoise, and Navy. Also worth noting, each frame comes complete with a special edition box, hard clam case, and carrying pouch to commemorate the collaboration. 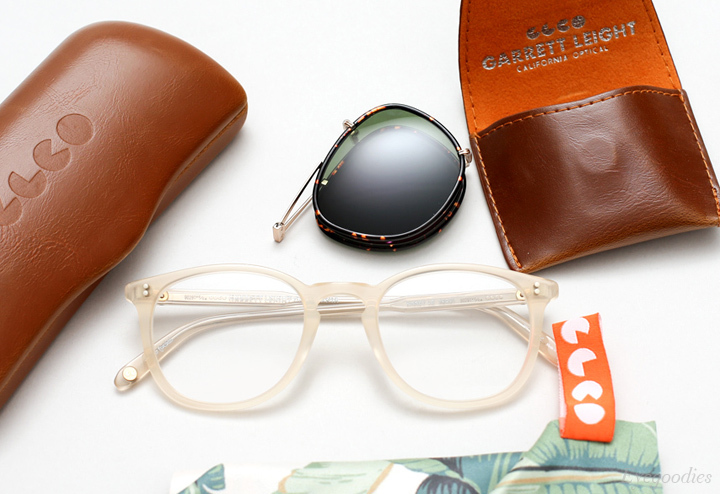 Garrett Leight California Optical’s Spring/Summer collection is inspired by timeless getaways, and the colors of that serene oasis we all want to escape to. Clean, classic, and comfortable frames shine in a well balanced mix of rich, soft, and vibrant hues. Colors such as, “Whiskey Tortoise”, “Leight Beige” reminiscent of the soft sand, and “Pink Blush” a vision of cotton candy. 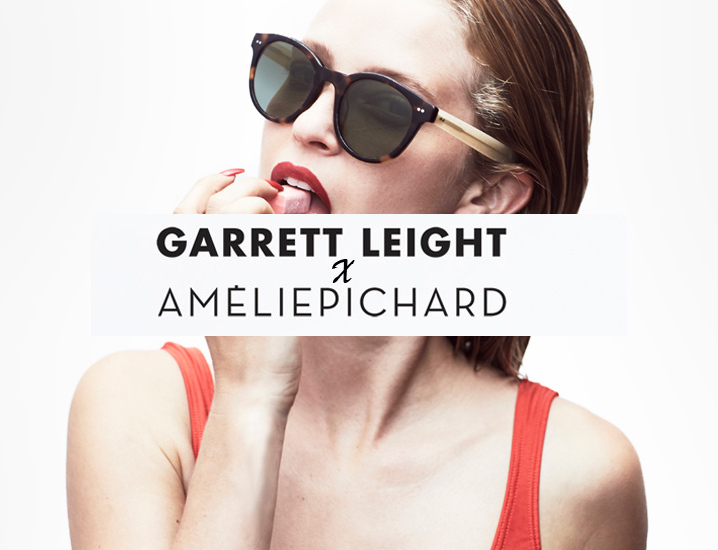 Garrett Leight California Optical joins forces with French accessory designer Amélie Pichard for a limited edition sparkly chic sunglass. 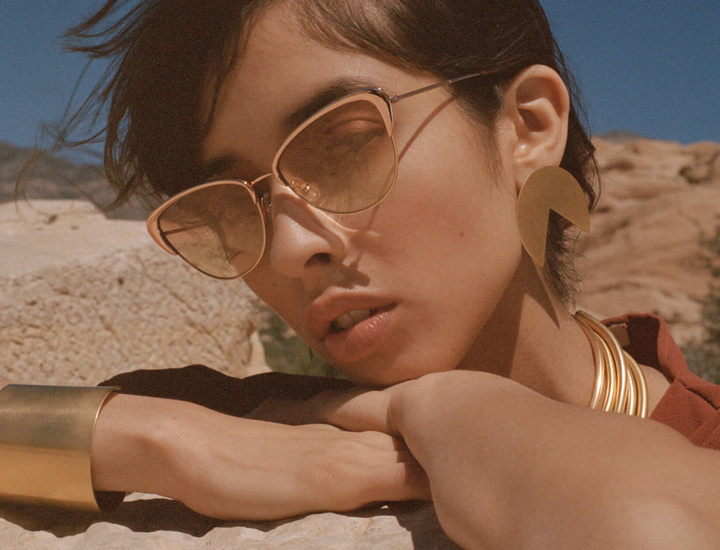 Fusing Pichard’s signature sense of dreamy surrealism and glamour with Leight’s California cool aesthetic —the result is a frame that is undeniably feminine and playfully sophisticated. Named after three personalities of femininity: Grace Jones, Juliette Lewis and Pamela Anderson — the Juliette sunglass featured here juxtaposes a rich dark tortoiseshell acetate front with beige glitter temples and is finished with soft green gradient lenses. 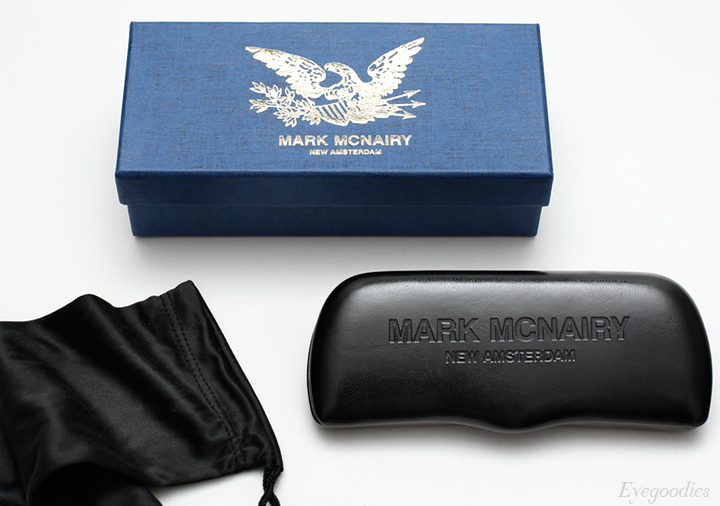 To commemorate the collaboration each pair comes complete with a special edition presentation box and carrying pouch. 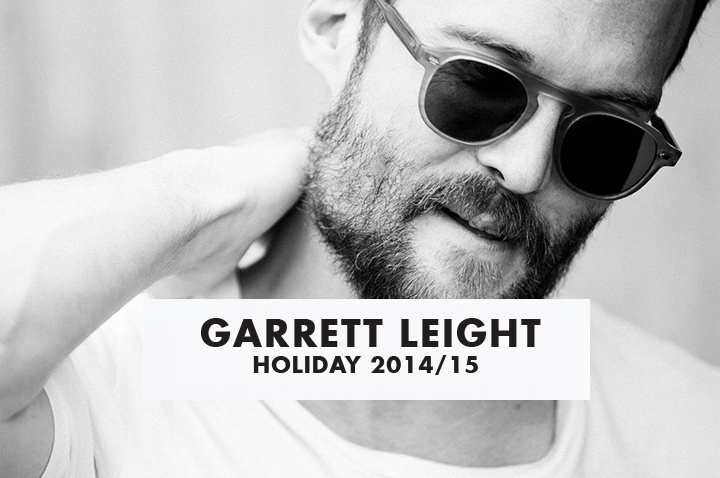 Los Angeles based, Garrett Leight is back with some classic California cool new additions for his Holiday 2014/15 lineup. This season mainly focuses on expanding an already impressive core collection. 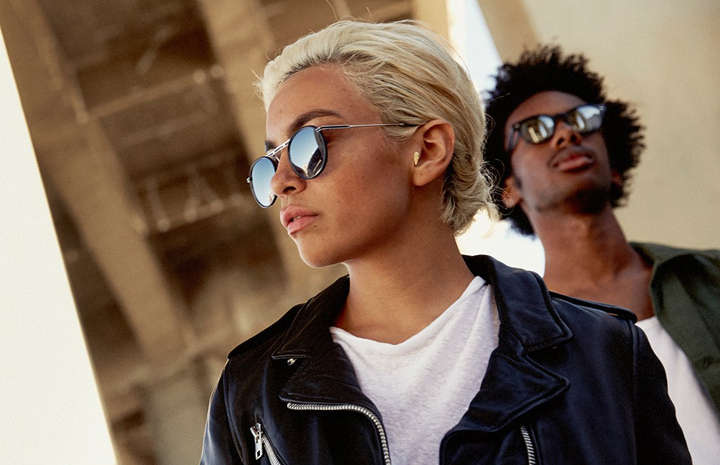 There’s a host of new rich acetates and lens colors — including frames with technologically advanced “layered mirror” lenses, clip-on lenses, as well as additional larger sizing options. Also be sure to checkout the new Bentley sunglass, a timeless design that feels right at home with GLCO’s signature clean aesthetic. 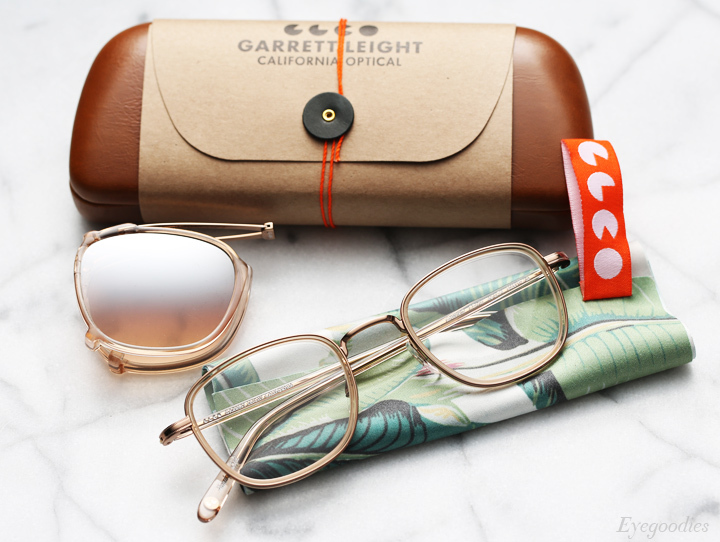 The new Garrett Leight California Optical Spring/Summer collection delivers all that we have come to expect and love from the West-Coast label. A carefully selected mix of well-executed, clean, and classic sunglasses and optical frames join the GLCO line-up. 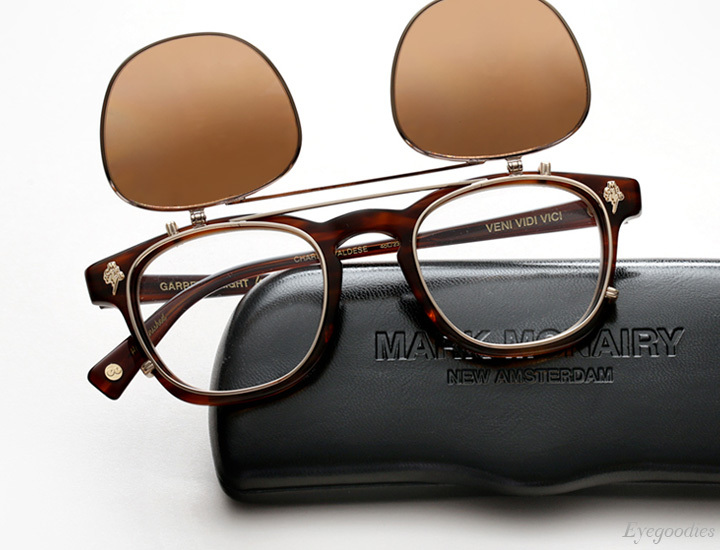 Particularly impressive is the wide assortment of unique signature acetates and color combo’s each style is available in, colors such as: “Brandy Tortoise”, “Matte Blonde Tortoise”, or one of our favorites “Butterscotch” with “Pure Green” lenses.